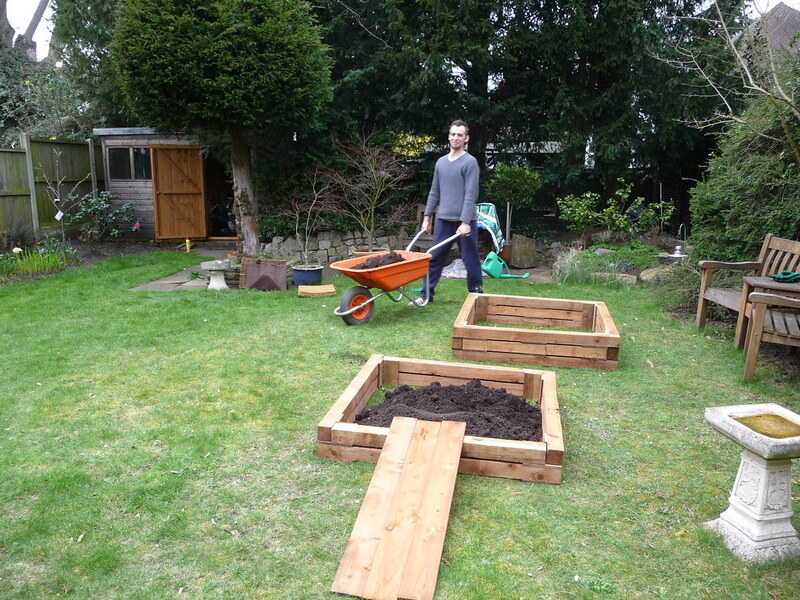 I would more normally used recycled scaff planks for raised beds but my mum had already plumped for a B&Q kit. It was rather unnecessarily high so we cut into two and filled up with compost that my mum has been hoarding for a while. 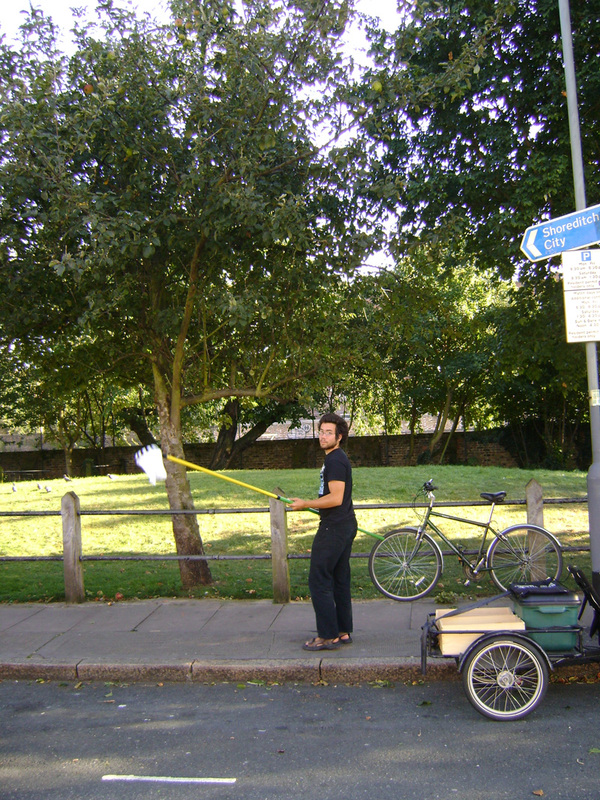 Once filled we temporarily covered with plastic to stop cats, squirrels and others diving in for a cheeky dig. I have recommended that she buys one of Rocket Garden’s excellent growing kits from here which i have now used on a number of occasions. 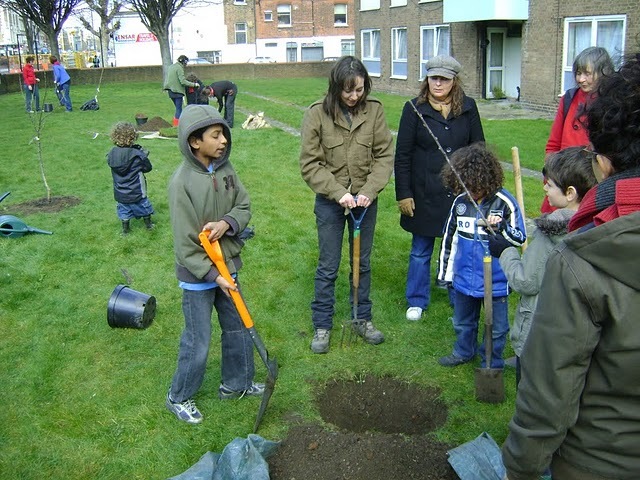 This winter I have been blessed with the opportunity of working with the residents of Somerford Grove, a council estate bordered to the north by my road, to plant thirty two fruit trees. This includes a mulberry tree, a few pear and plum trees as well as twenty six different varieties of apple tree. I have no idea what competition there is but I would love to think that this may be one of the biggest and most varied orchards inside the M25 …and i still have the budget to plant another 30 trees next winter! 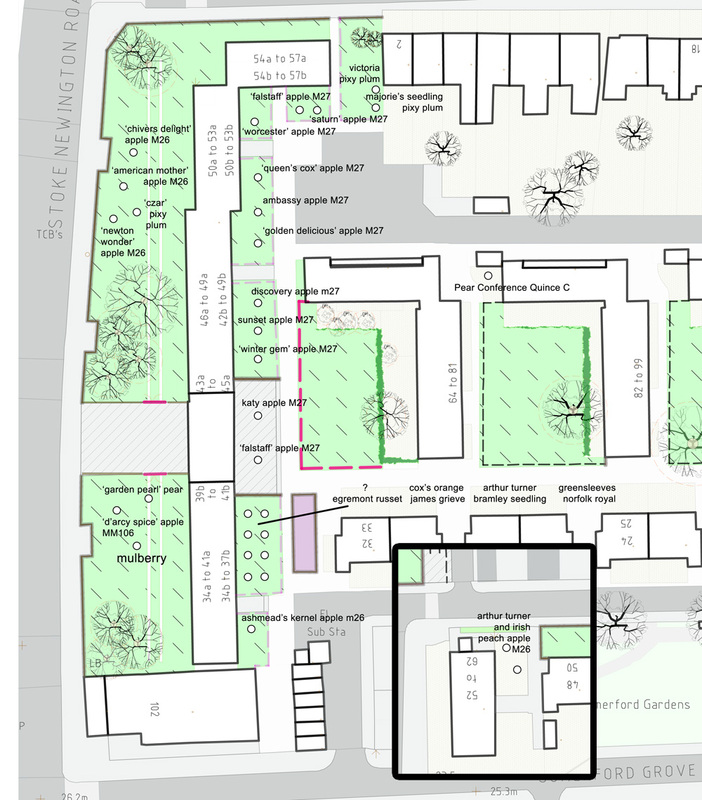 The first nine trees were planted as part of the ‘Making Space in Dalston’ project by J&L Gibbons with muf architecture/art for the London Development Authority. 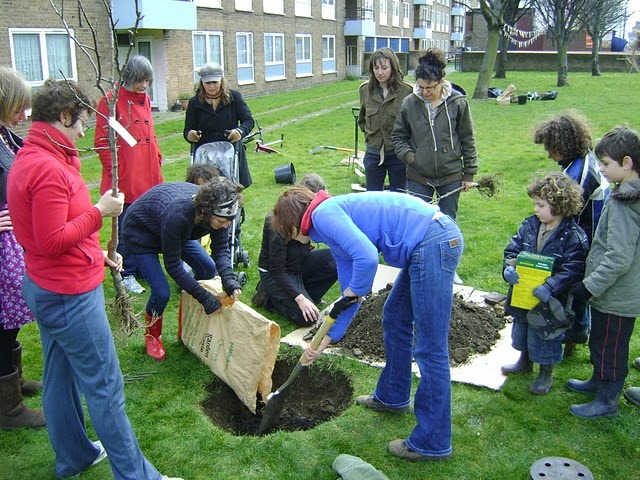 The London Orchard Project donated the trees. 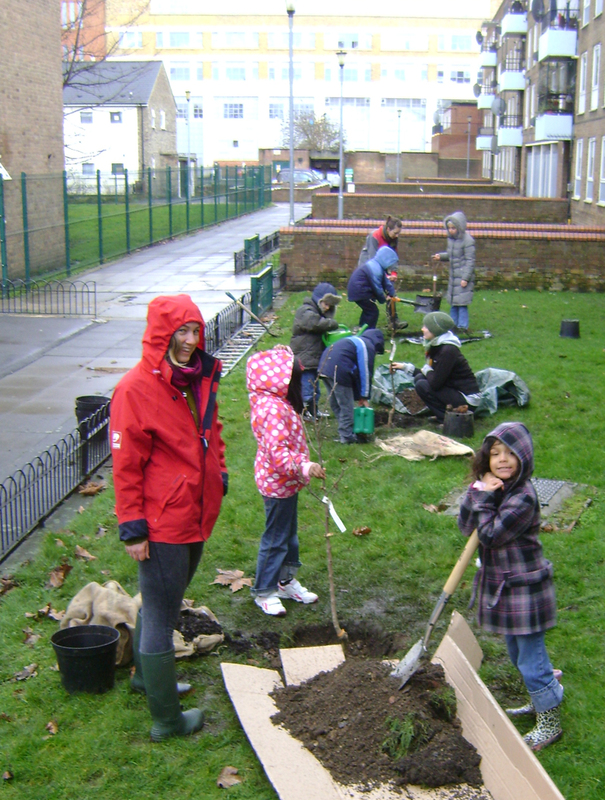 The rest of the trees have been funded by the Play Pathfinder scheme actioned by The Learning Trust. Cllr Louisa Thompson has been a great source of support in helping this to happen. The trees were all bought from Blackmoor nursery who have been excellent. 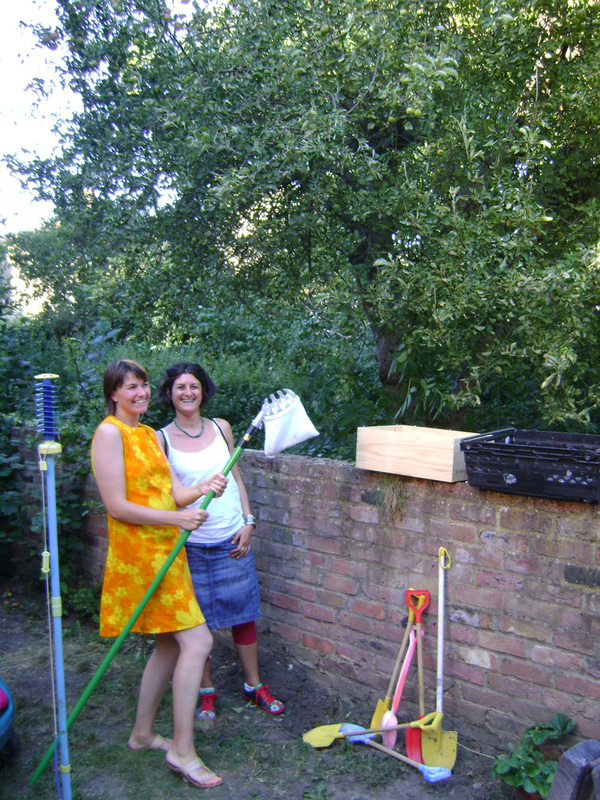 Hedvig Murray from Get Growing has been working with me to make sure all the planting went off without a hitch. The trees are mostly M27 very dwarfing rootstocks where near buildings (max height 2-3m) and M26 semi-dwarfing rootstock in the bigger patches of green (max height 3-4m). I decided to not protect the trees with stakes or mesh, having faith that the residents will look after them having planted them. Also by not spending money on protection, I was able to plant quite a few more trees so if any do get damaged then nothing will have been lost overall. Alex Collings, Anna Garforth and Helen Babbs all deserve a shout for pitching in to help too. The first nine trees were planted as part of the ‘Making Space in Dalston’ project by J&L Gibbons with muf architecture/art for the LDA. 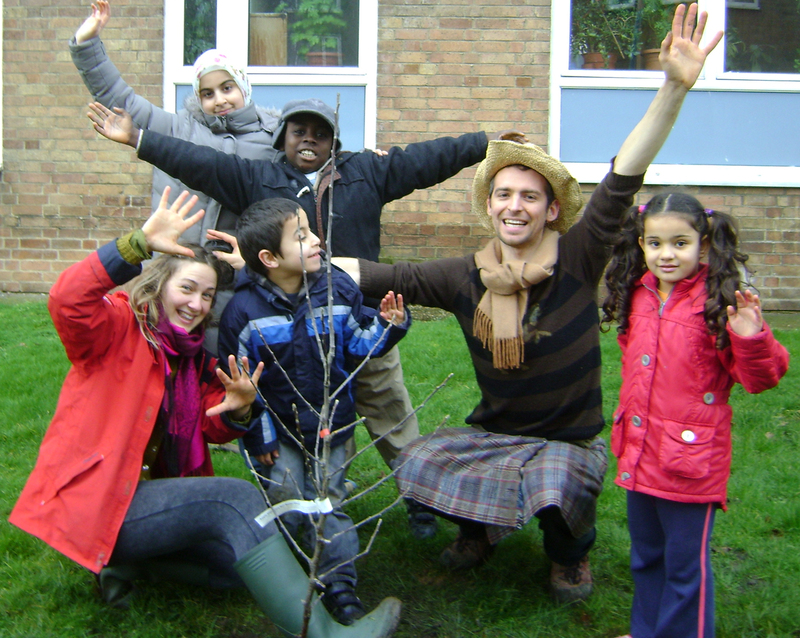 The London Orchard Project donated the first nine trees. Okay, East London Community Recycling Partnership are gods – officially. A few weeks back I helped Stepping Stones Farm in Stepney pick up a few tonnes of free compost from a depot on the south edge of hackney marshes – they have wood chip too, a LOT of woodchip… and a LOT of compost… did I mention that yet? LOADS OF IT. The picture above gives you an idea of a small part of the depot which is officially open during the day on week days… but you could easily pop in at other times as much of it is not really fenced off. 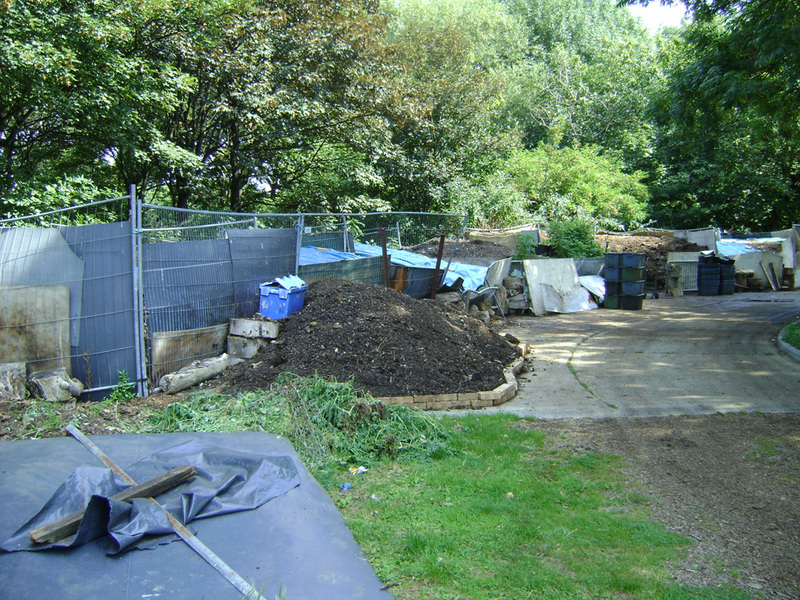 A few days after I went and picked up the compost they called me up and asked me if I could take a few tonnes more… seriously get your arse down there and get growing! I curiously manage to be a hoarder who aspires to have few posessions. Every so often my ruthless streak overcomes my hoarding streak and I eBay, freecycle or put things out on the street to get rid of them. Music magpie (http://www.musicmagpie.co.uk/) is a service for online buying of second hand cds and I have to say I am pretty impressed by their service. You type in the bar code, they make you an offer for your cds, then they send you postage stickers which you use to post them the cds using recycled jiffy bags which you have been hoarding too. Brilliant. 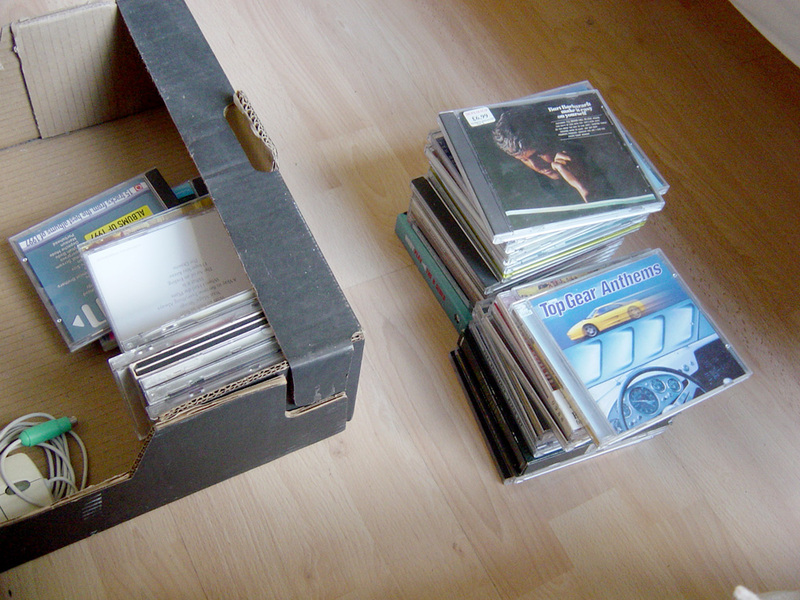 …and yes I did sell my Burt Bacharach cd… £36 for 27 cds was the final count – that is quite a bit of carrot cake. 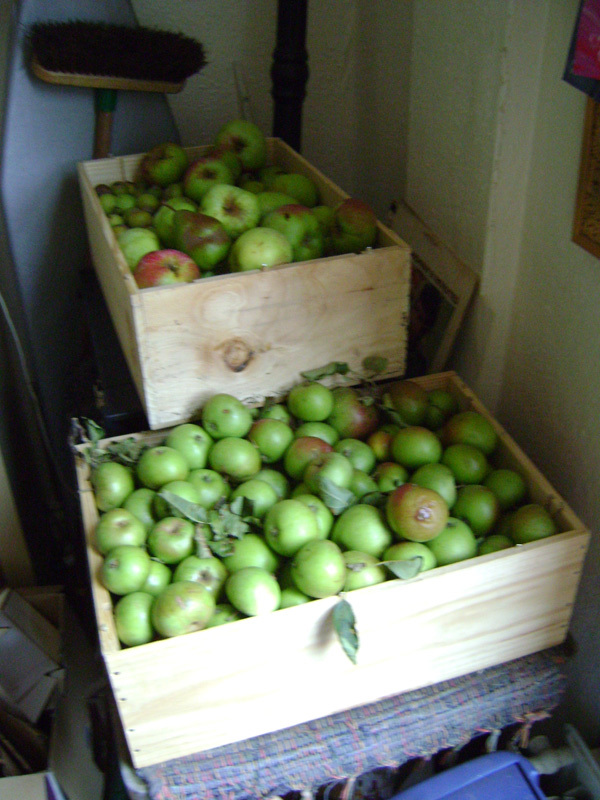 We had so many apples from our scrump that I set up shop on my street and started giving them away to neighbours which then resulted in my being invited into various back gardens to pick more! I am now the proud owner of this rather splendid recumbent quadcycle called a ‘Brox’ which I bought from Bikefix (http://www.bikefix.co.uk/). Unfortunately they are not in production anymore so you will have to search about if you want one. 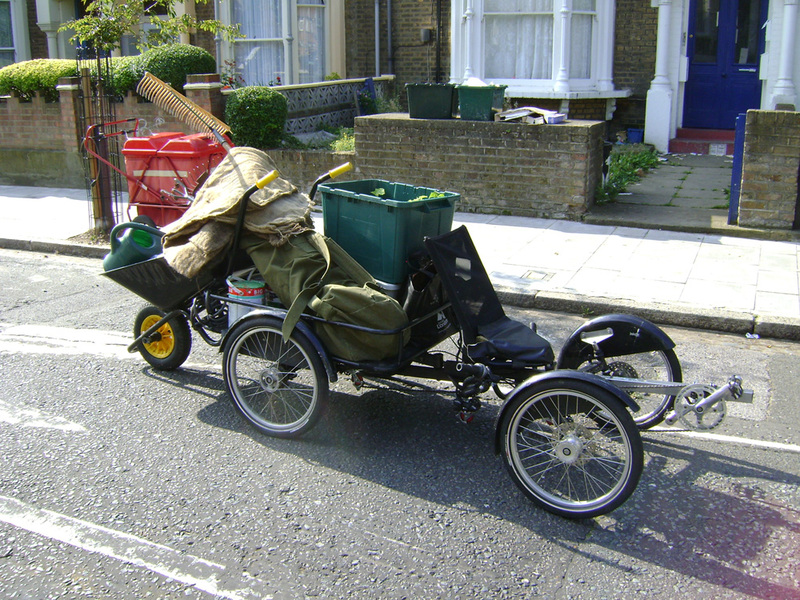 It has been absolutely amazing for transporting tools and plants around hackney. 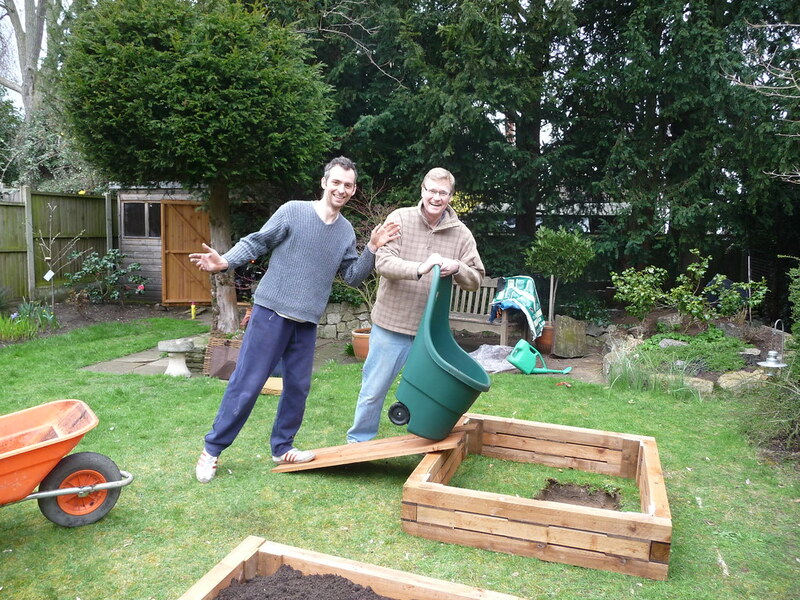 Today I managed to attach the wheelbarrow to the back to make it a pentacycle! Happy days. 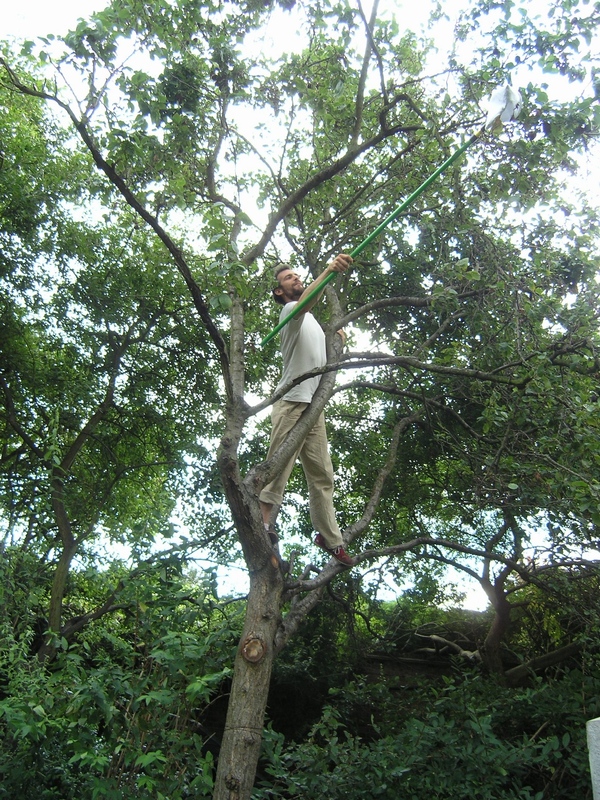 I was never quite sure how we were going to get all of the plums harvested from the top of such a huge tree and then someone suggested I buy a special tool to do the job which I must confess hadn’t occurred to me! The rest, as they say, is plum jam, plum pickle and assorted other forms of plum joy history. 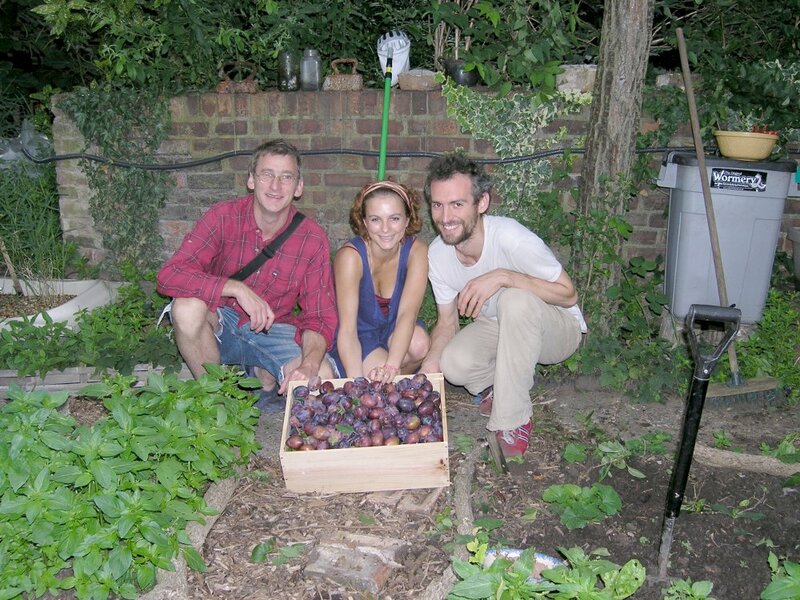 The picking team with over 10kg of plums... we only stopped when it got dark!